Kalb wrote: Maktub: Do you think that the basis of Asetianism was explored and created in the Temple of Edfu? Mainly the 7 Sacred Pillars? kalb...I just read across this and I thought of your post here....I will repeat what I just read as I thought you would find this interesting. All cells and bodily organs regenerate themselves according to cycles based on the number 7. Certain parts of our body are renewed every seven minutes, others every seven hours and others every seven months or every seven years. These cycles actually influence the transformations continually operating in our body. It says change is the primary law controlling matter. We have all heard that our lives change and go into a different path every 7 years through our life. What if each pillar represented a time of historical change that repeats itself just as our lively body does. Asetianism is as alive today as the earth itself is. Both in material and etheric manifestations. Nightshade wrote: I believe the great pyramid to be the result of ancient Asetian technology used for advanced initiation and energy work. It's much more a structure of great magick and power than a tomb which is a much later theory. I often wonder about the story of the sheik that after hundreds of years broke open the pyramid that was sealed completely. He had his workmen open it as it was completely sealed looking for some treasure. Sitting there sealed all those years can you imagine what the energy that had been stored there after the magical work and initiations that had accumulated that stored energy felt like? Interesting detail, Maxx. Never thought of it that way. Over the time and my meditative explorations, I came to the conclusion that the Pillars really have an influence on us, especially Khepri Pillar, The 7 pillars is not something that is only understood in the physical plane, but who dwells in all planes of consciousness and Realities. But overall, this change happens the way we view Asetianism, in my case I have vibrated and felt this Pillar several times, because I am a certain degree of evolution where my understanding has arisen through commitment. In others, this pillar does not work at the same level than the one I'm vibrating, and that change happens in unexpected forms, sometimes in frustrating ways. But it happens. We do not have a true perception of reality, and here on the physical plane, is complicated because everything is set in hours and days, is the Power of limitation. And this concept of evolution is strongly enforced in the teachings, whatever our path, the price to pay for it will be in this life or the next, if next we see clearly that the physical time as a human being was not enough. This is quite interesting Maxx and I agree with your view on such matters. Can you share more about your view? there could be a possibility that the lower 7 sephiroth are tied to the seven pillars as well as the seven sisters of the heavens or planets or stars. Maybe all apply. These would be separate from the upper 3 sephiroth if you see what I am getting at. This part is explained in the Book Of Orion, Maxx. Good detail too. Maxx wrote: there could be a possibility that the lower 7 sephiroth are tied to the seven pillars as well as the seven sisters of the heavens or planets or stars. Maybe all apply. These would be separate from the upper 3 sephiroth if you see what I am getting at. This is exactly my thought and how it seems to be taught by the Aset Ka. The 3 sephiroth or qliphoth above the abyss are the Asetians themselves, the three forces of the universe above the astral realms and the world of matter. I say sephiroth and qliphoth because the Asetians are ethereal forces of duality, so they have their lighter or angelic side and their darker and demonic side. These are the three pyramids and the three stars of Orion. The universal trinity. Then below we have the 7 keys to all understanding that can be studied as the 7 sacred pillars of Asetianism in the 7 lower sephiroth. It's all connected. About your first image I don't really see Kether connected with the brain at all. Kether is the most transcendent stage of spiritual evolution, way beyond the abyss of the ethereal, so it makes no sense to be represented by the brain. The brain is where our ego lies, all of our fears and expectations. The brain is our connection with the mundane and physical, not with the divine. Ego stays in Malkuth as it hinders your ascension through the tree. I have no sure if is it the Brain or the mind that the first image represent. 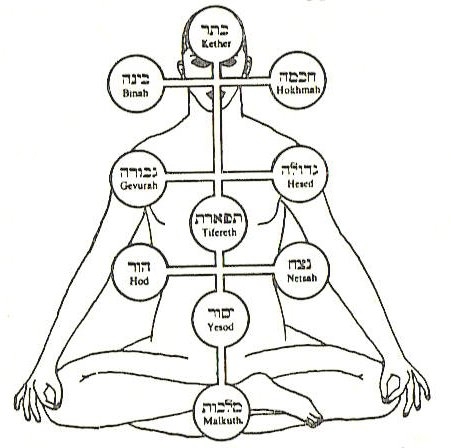 Kabbalah do not divide the mind into 3 categories, but into 10, and there is a line separating the abyss that separates the first three Sephiroth. Yechidah, Chiah and Neshamah, representations of Kether, Chokmah and Binah. These three are the "immortal" part of mind, I believe that is the state of Samadhi. Maybe that's what she wants to show us with the first image. If it was the case of mind, I believe that is well represented.